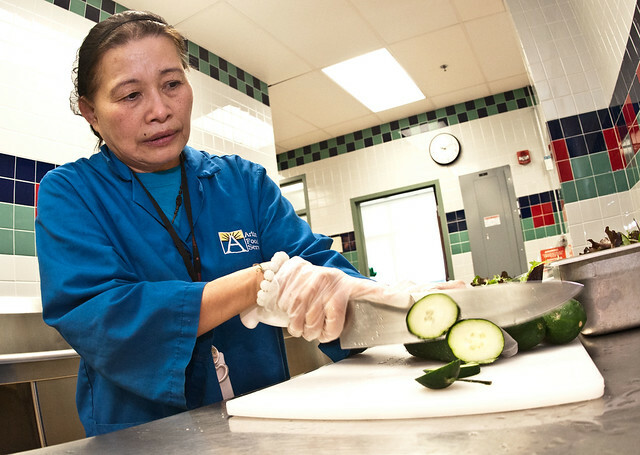 As a food service professional, you play a key role in Farm to School programs, especially when it comes to serving more local food in school meals. Farm to School programs provide excellent opportunities to introduce students to delicious locally-grown fruits and vegetables, grain products, dairy products, and meats. Incorporating local foods in school meals involves creative procurement, menu-planning, and recipe choice as well as a general understanding of local food and agriculture. From Farm to School: A Guide and Directory for Schools, Institutions, Organizations and Farmers for Buying and Selling Local Meat and Produce in the Hudson Mohawk Region, by the Hudson Mohawk Resource Conservation and Development Council. The NYS Fruit and Vegetable Harvest Calendar by New York State Department of Agriculture and Markets, and My(Northeast)Plate by NYS Department of Agriculture and Markets and Cornell Cooperative Extension show general seasonal availability of New-York-grown food. A Farm to You Fest menu by Bethlehem Central School District features seasonally-available foods from New York Farms. Harvest of the Month by Massachusetts Farm to School Project emphasizes a seasonally-available food each month. The National Farm to School Organization’s publication, Farm to School: A Tool for Success with the New Nutrition Standards, describes how purchasing local foods supports the new school meal pattern requirements. Two school-tested cookbooks, produced in states with similar growing seasons as New York, focus on local seasonal foods, and include tips for introducing new recipes to students. New School Cuisine: Nutritious and Seasonal Recipes for School Cooks by School Cooks by VT FEED is available to download from their website. Fresh from the Farm: the Massachusetts Farm to School Cookbook was produced by Massachusetts Farm to School Project. The New York Coalition for Healthy School Food has developed Cool School Food Program Recipes that note which ingredients are New York State farm products. Local Cornell Cooperative Extension professionals may be able to help identify farmers who are interested in selling directly to schools, and know about other Farm to School efforts in your area. Finding, Buying, and Serving Local Food, a webinar series, and Procuring Local Foods for Child Nutrition Programs by United States Department of Agriculture Food and Nutrition Service (USDA FNS) provide extensive guidance specifically for food service directors. Fact sheets by USDA FNS describe how to use geographic preference and the Department of Defense Fresh Fruit and Vegetable Program to procure local foods. Two worksheets, Purchasing Locally Grown Foods from a Conventional Distribution Company and Local Foods Procurement Worksheet, by Massachusetts Farm to School Project describe how to purchase local foods from distributors or farmers. The Checklist for Purchasing Local Produce by Iowa State University has questions to ask farmers regarding their food safety practices. Many farms have Good Agricultural Practice (GAP) certification. Best Practices: Handling Fresh Produce in Schools by USDA describes safe handling of fresh produce to reduce risks of foodborne illness. Anticipating, Savoring and Preserving the Harvest: Hands-On Training Workshops to Increase Local Farm Products in Cafeterias by Fingerlakes Farm to Cafeteria Program describes a series of workshops to help food service professionals use more local farm products.